Why Are Catholics Rushing Anti-Life Health Reform? Seeking healthcare for the needy is one thing,but supporting the current draft of health care "reform" is entirely different, and I believe actually antithetical to the first idea. Now when I see this picture with (at least one) Catholic bishop in front of the USCCB offices in DC (I&apos;ve walked by it often) .... I agree that we should seek health care that protects life ... but the fact of the matter is that the current form of health care reform we are looking at does not protect life. 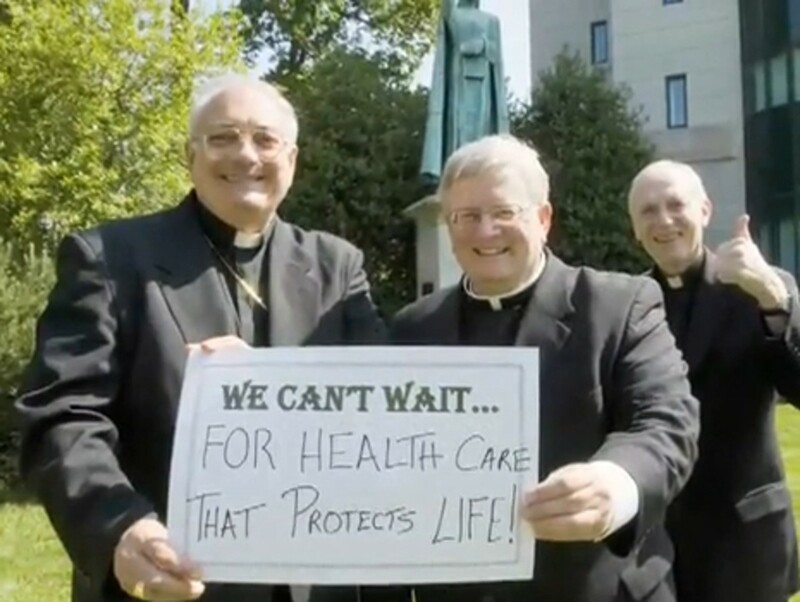 So why on earth is this picture used in this video by the Catholic Health Association&apos;s campaign to pass health care reform "NOW"?! The picture ought to be featured in a video complaining that the current health care reform bill does not protect life ... so we&apos;re still waiting. Jack Smith describes what "NETWORK - A National Catholic Social Justice Lobby" (founded in 1971 by 47 women religious) is doing to support Obama&apos;s plan. The Society of St. Vincent de Paul and Catholic Charities USA sent out an action alert asking members to contact their legislators immediately. "Please call and e-mail your Representative in the next 24 hours expressing your support for Congress to enact health care reform now," the groups said in a joint action alert last week. "Saint Vincent de Paul is partnering with Catholic Charities USA and the Catholic Health Association to amplify our collective voice to let Congress know that health care reform can not wait," that group says on its web site. When LifeSiteNews.com (LSN) described the healthcare plan&apos;s abortion mandate to Roger Playwin, the National Executive Director of the St. Vincent de Paul Society, he interrupted to say: "The bishops&apos; office has advised us that that&apos;s not accurate. So I can&apos;t speak to it, because all I know is that the bishops&apos; office has said that story is going around, but it&apos;s inaccurate. That&apos;s all I know." Um, no, Mr. Playwin, you are mimicking the abortion-lobby&apos;s talking points. LifeSiteNews has posted easy ways of contacting the various organizations. I could go into all of this in more detail, but I&apos;ll try to keep it short: telling people that Congress needs to fix health care "now" will only result in enacting a horrible piece of legislation which will not fix the problems it was written to solve, and will include many things which Catholics ought to oppose, such as mandated abortion coverage with taxpayer money. It&apos;s extremely disappointing to see organizations charged with caring for the poor making such poor prudential decisions. If you follow the LifeSiteNews link above you can read an embarrassing attempt to justify this decision when the simple facts, I submit, should make us conclude that current bloated form of legislation being considered in Congress is something we shouldn&apos;t wait to vote No on. The faster we get rid of this false start, the faster we can take a look at pursuing real health care reform. Is Euthanasia Really Part of Health Care Reform?